Few states show more dramatic contrasts in their environment than Washington. Elevations range from sea level to over 14,000 feet. Precipitation varies from over 200 inches annually on the Olympic Peninsula, nurturing a temperate rain forest and mountaintop glaciers, to a mere six inches in parts of the Columbia Basin, where near-desert conditions prevail. The primary reason for these contrasts is the Cascade Range, which runs from north to south the entire length of the state. Pacific storms slam into Western Washington for much of the year. The Wet Side is often cloudy and enjoys moderate temperatures at all seasons. East of the Cascades, Washington's Dry Side has a rain shadow climate. Summers are hot, winters cold; clear skies are the norm. Between these extremes, an array of aquatic and terrestrial communities supports a remarkable diversity of bird species. Typical of the Wet Side are Black-footed Albatross, Trumpeter Swan, Black Turnstone, Mew Gull, and Rhinoceros Auklet, while the Dry Side is home to the Spruce Grouse, Flammulated Owl, White-headed Woodpecker, Black-billed Magpie, and Brewer's Sparrow. A Birder's Guide to Washington details hundreds of birding routes and sites in the state and adjacent areas in British Columbia, together with year-round access instructions and birding advice. Over 220 maps pinpoint the most productive destinations in the field and offer regional overviews to help with trip planning. An annotated checklist of 478 species recorded in the state through 2002 gives information about status and habitat associations, while the seasonal abundance/regional occurrence bar graphs will assist birders in locating regularly occurring species. 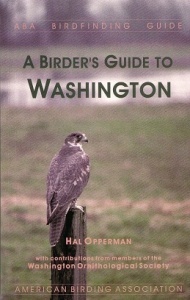 Authoritative lists of Washington's mammals, herps, butterflies, and dragonflies are provided. Members of the Washington Ornithological Society were instrumental in contributing site descriptions or information about their local areas as well as in field-checking the text and maps. Master Artist Tony Angell has illustrated the guide. A Birder's Guide to Washington, the eighteenth ABA Birdfinding Guide, is based on and expanded from Terence R. Wahl and Dennis R. Paulson's A Guide to Bird Finding in Washington, since 1971 the definitive source for birding the state. 650 pages.